Easily handling 1500 lbs., the biggest advantage of purchasing the mark power Series adjustable fid utility bench XM-9010 is the design. This bench offers unbeatable comfort, durability and adjustability only found with mark. From decline to military press position, this adjustable fid utility bench offers a 7 position adjustable back pad ranging from decline at negative 20 degrees to an incline position of 85 degrees. The seat pad has 3 ergonomically designed positions to meet your weight lifting demands. Xmark's fid utility bench is constructed of heavy duty 2" x 3" steel. The bench cushions are made of extra thick 3" firm padding covered in double-stitched, sweat and tear resistant vinyl. Transporting this heavy bench is made easy with rear transport wheels. Easily handling 1500 lbs., the biggest advantage of purchasing the XMark Power Series Adjustable FID Utility Bench XM-9010 is the design. 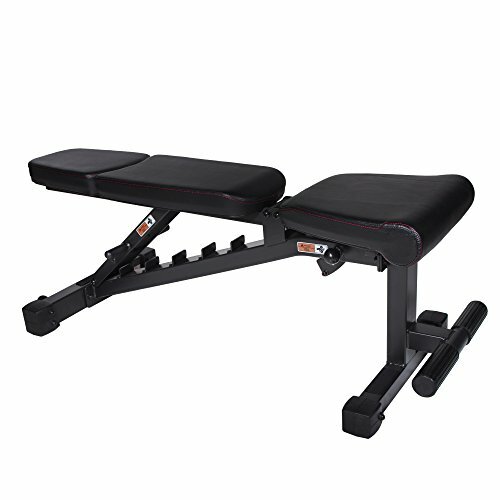 From decline to military press position, this adjustable FID utility bench offers a 7 position adjustable back pad ranging from decline at -20 degrees to an incline position of 85 degrees. In addition to the 7 position adjustable back, the seat pad of the XM-9010 has been ergonomically designed with three positions. Finished out in extra thick 3" firm padded cushions covered in double-stitched, sweat and tear resistant vinyl, this bench is a gym quality bench for your home use. Adjustability, affordability and durability are what you have come to expect and receive from XMark, the mark of excellence.